In August 1998, we visited my Mother in central Illinois. One afternoon, while my husband sat in the next room watching the Chicago Cubs lose another ballgame, Mom and I sat at the kitchen table going through a box of old photos, identifying the subjects and clarifying relationships. If family born in the late 19th or early 20th Century were to be remembered, I needed more to work with than “Uncle Harry and Aunt Ora.” I was penciling in details on the backs of photos. A pad of paper was nearby. Old photos stir memories. Mom identified a picture of an infant as Freddie, one of her three brothers who did not make it to adulthood. 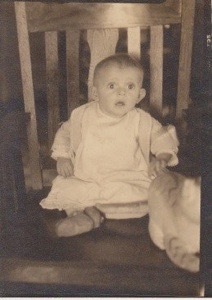 The little fellow was seated in a wooden chair with a stuffed toy. His worried expression made him endearing. When Mom spoke about him, something about her tone of voice made me take notes. Freddie had pneumonia when he was six weeks old. “They didn’t have medicine for him in those days. He was sickly. He wasn’t well. If he’d get too excited, he’d begin to turn blue,” she said. Mom’s oldest brother, Louis, died when she was five. Bernard, born in between Louis and Mom, lived only a few months. “I never knew Bernard,” she said. It was obvious she had been close with Freddie. As the oldest child, she helped with all her brothers and sisters. Her parents didn’t go out often, but once in a while they’d attend a platform dance out in the county. When they did, she was left in charge of her siblings. “None of them were hard to care for. They minded me. I was young, but I was responsible. We all had responsibilities in those days,” she said. I had stopped taking notes. We’d been dividing photos into groups. One set of pictures was coming with me to Texas. I would not leave Freddie behind. That afternoon was my last chance to gather family history and fill in missing pieces. It was the last afternoon I’d spend with my Mother. Of course there were our weekly phone calls. And we planned to get together in Galveston for Christmas that year, but it wasn’t meant to be. On a cold night in December, Mom died peacefully in her sleep. Sometime today, I should go through family photos and stir up pleasant memories. It would be a good way to commemorate her birthday.